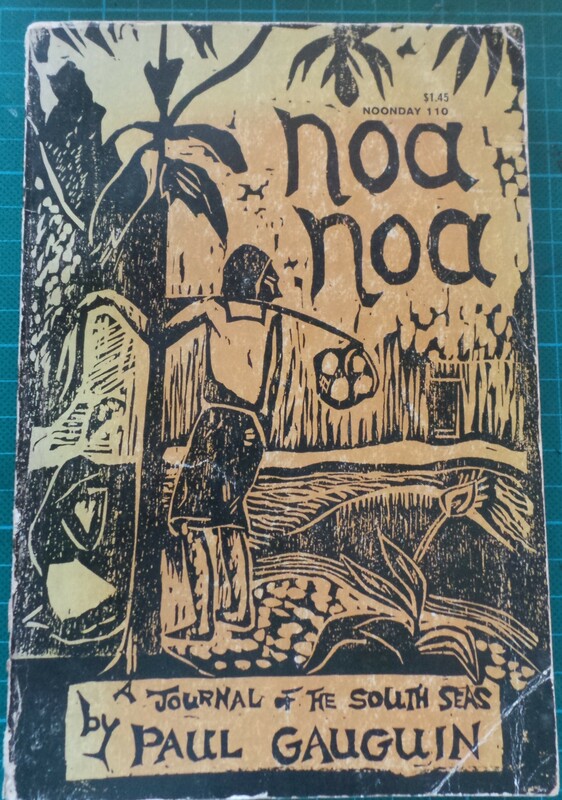 I bought this book in Rio last year; drawn particularly by the woodcut; by Gauguin. It tells the story of Paul Gauguin, the forty-three -year old ex-stockbroker who left France for Tahiti where he was to make his home. Here, he is disappointed to find even this South Sea island Tahiti is spoiled by the inroads of Europe and he compelled to move further and further into the back country in order to attain some primitive ideal of naturalness and peace. Paul Gauguin (1848-1903) was one of the great initiators of Post-impressionism and thus one of the fathers of modern art. Misunderstood and neglected in his lifetime, he is now regarded as a pathfinder and pioneer and his works are among the prized possessions of museums and galleries in Europe and America. … I just love this little book. What a great cover! I love Gauguin.